Sprouting beans and lentils is a good way to get the most out of them in terms of digestibility and nutrients. I often add sprouted beans to Chinese meals and salads, but little one loves his pasta so thought it would be a nice combination to try. 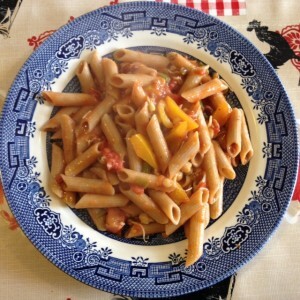 This recipe is vegan and gluten free as I used a brown rice pasta, although you can use any type of pasta – I found some amazing sprouted pastas the other day at the local health food shop which I may have to try. It is full of protein from the beans as well as three portions of vegetables. A great quick meal for work nights, and the sauce can be frozen up to make for an even quicker meal. Pour the sauce over the drained pasta and return to the heat for a further 2 minutes. This can be served with grated cheese on it, but is delicious just as it comes.